www.sefindia.org :: View topic - One km Tall Towers- Where are they? Posted: Tue Mar 15, 2016 10:33 pm Post subject: One km Tall Towers- Where are they? When Taipei 101 Tower broke the half-km mark in height, there were proposals to build super Tall Towers having a height of one km or more. These proposals include the Burj Mubarak Al Kabir in Kuwait and Azerbaijan Tower in Baku. 2. Construction of the 115-floor, 555.1 m tall Ping'an International Finance Center started in Shenzhen, China, 2010. 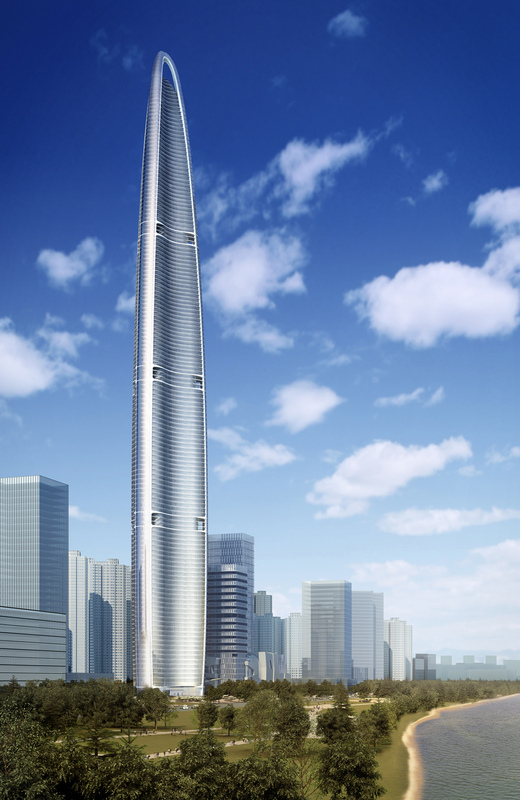 It will be China's second tallest building and the fourth-tallest building in the world. The antenna was removed (hence the height reduced from 600m) due the possibility it can obstruct flight paths. 5. Construction of the 125-floor, 625 m tall Rama IX Super Tower started in Bangkok, Thailand in 2014. It is set to become the tallest building in South East Asia. 6. Construction of the 123-floor, 555 m tall Lotte World Premium Tower started in Seoul, South Korea in 2012. It is set to become the tallest building in the OECD, with the tallest observation deck in the world. 7. Construction of the 110-floor, 510 m tall Busan Lotte World, Busan, South Korea, started in 2009. It is slated for completion in Oct. 2016. 8. The 86-floor, 463 m tall Lakhta Center in Saint Peterburg, Russia is set to become Europe's tallest building when completed in 2018. 9. Construction of the 102-floor, 487 m tall 151 Incheon Tower in Songdo International City, Incheon, South Korea, started in 2008, which is scheduled to be the tallest twin towers in the world when it is completed. 10. World One is a 442 m tall residential skyscraper under construction in Mumbai, India. It is located in Upper Worli of Mumbai on a 17.5 acre site. The project will cost INR 2,000 crore (US$380 million), and expected to be completed during 2017 and will become the world’s second tallest residential tower on completion. It will also scheduled to get the Leed Gold Certified rating by the Green Building Council. World One is designed by Pei Cobb Freed and Partners and Leslie E. Robertson Associates. 11. Millennium Tower in Frankfurt, Germany is set to become the tallest skyscraper of the European Union, at a height of 369 m (with 97 stories. One third of the tower is supposed to be residential. The current U.S. Republican Presidential runner and real estate tycoon Donald Trump planned for this construction project in Frankfurt during 2000. But, due to the economic crisis in Germany, marketing efforts for this tower were stopped. The general situation of the real estate market improved in the early 2010s and hence the Millennium Tower may become a reality soon. Posted: Tue Apr 19, 2016 6:41 am Post subject: A Super Tall Building in Highest Seismic Zone of USA. With all recent post on Risks of Earthquakes in Japan, Ecuador, Nepal, Pakistan/India , Structural Engineers are going ahead with such Tall Structures. Looks like Structural Engineers of such Super Tall structures have perfected the ART and SCIENCE of Ductile Detailing in Steel Structures and Concrete Structure. What else to say about these Structural Engineer who are telling thousands of people in such High Seismic Zone that do not worry , you are in GOOD HANDS , you are safe. ( Note: This phrase "YOU ARE IN GOOD HANDS" comes from an advertisement of ALL STATE INSURANCE COMPANY in USA). tallest building on the West Coast ( Highest Seismic Zone in USA). Posted: Tue Apr 19, 2016 3:40 pm Post subject: Re: A Super Tall Building in Highest Seismic Zone of USA. Thank you for the info. From the website, I am giving below some info. for the benefit of SEFIans. This Wilshire Grand Center skyscraper in Downtown Los Angeles, to be completed in early 2017 and reportedly built at an estimated $1.2 billion, will be 335 m tall, and will become the tallest building on the West Coast of USA (compared to this New York City's One World Trade Center is 541 m tall and the 163 storey Dubai's Burj Khalifa tower is 830 m tall with a cost of construction of $1.5 billion). However, the Wilshire Grand Center will enjoy its claim to fame for a short period, as the Seattle's 4/C tower is scheduled to overtake it by a mere 3.35 m in 2018, according to the Los Angeles Times. Currently under construction, the top portion is yet to be clad in its glass casing. The building was designed by AC Martin. The glass-encased tower will have a clean, reflective finish. Thirty-five elevators will take visitors to their destination floors.The curved top is definitely a departure from the style of any other Los Angeles skyscrapers, which tend to be more traditional in appearance. It has a distinctive "sail" design. The area at its base will include green space and a pedestrian plaza.The Wilshire Grand Center will be the first new tower-based office space built in Los Angeles in the last 20 years, according to the New York Times. The tower overlooks the whole of the city and surrounding mountains. To speed up construction, the tower is making use of innovative "plug and play" bathroom pods. 698 of the pre-assembled "pods" are being installed throughout.